This 35 acre property is located 5 miles east of Mount Sterling, IA 52573 in Van Buren County. The property hold lots of whitetail deer and turkey, and sits just across the road from some incredibly managed property. It has most recently been used for pasture, but holds tons of potential now the livestock is off the farm. There is a creek running trough the land, and lots of hardwood timber. Nick is a Southeast Iowa native and other than a few short years living in Michigan, has lived in the same community he grew up in. Nick’s passion for the outdoors started at a young age while quail hunting with his father and grandfather. After a few years of upland/small game hunting Nick started bow hunting the huge whitetails that call Iowa home. 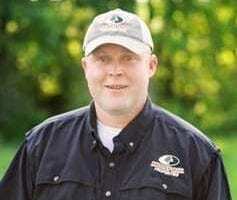 Nick also owns a very successful outfitting business, Windy Ridge Outfitting, which hosts trophy whitetail and turkey hunters in Iowa and has become the premier place to hunt in the Midwest. You can check out his website at www.huntwro.com for more information. Nick and his wife Abby live on a great hunting property in famed Van Buren County, Iowa with their 4 kids, Parker, Sophie, Cooper and Drake.